Home is at the center of human experience. We spend our lives designing, maintaining, enjoying, escaping, and defending what we consider home, a word which can refer to the intimate space of an HDB flat and also to the larger scale of the nation. But home is more than a location. It is an idea and a process, linking seemingly unrelated social, economic, political, and cultural spheres. We can learn a lot about Singapore by taking the topic of ‘home’ seriously, by exploring the meanings embedded within the word. The study of home raises important questions about our residences, our neighborhoods, and our identities. What is home? How do we make a house a home? Who belongs and who doesn’t? And who decides? This event gathers artists and academics who ask such questions in their creative and scholarly projects. During this panel, they will discuss why constructs and imaginings of ‘home’ are so important in today’s world, and will share their recent work related to the place, idea, or process of home. 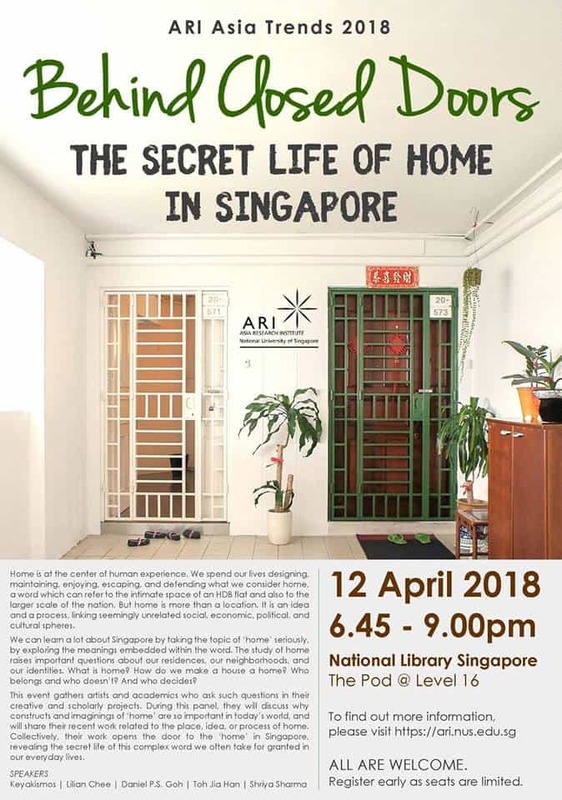 Collectively, their work opens the door to the ‘home’ in Singapore, revealing the secret life of this complex word we often take for granted in our everyday lives. Keyakismos is the artistic pair of Eitaro Ogawa and Tamae Iwasaki. They are co-authors of HDB: Homes of Singapore (Gatehouse Publishing, 2017), a book featuring hundreds of photos celebrating the art and culture of humble HDB interiors, which was featured at the Singapore Pavilion at the Venice Biennale 2016. Derived from the Japanese word “keyaki” (Zelkova tree) and “cosmos” (flower), their alias stands for their shared creative philosophy that the collaboration among different elements achieves much more than one. Motivated by their life motto – “love God, love people” – Eitaro and Tamae are involved in art and community projects such as Pameran Poskad, which encourages all sorts of collaborations, with the goal of creating opportunities for people to experience art in daily life. They have two lovely daughters. Lilian Chee is Associate Professor and History Theory Criticism Research Cluster Leader at the Department of Architecture, National University of Singapore (NUS). She is a writer, designer, curator and award-winning educator. A recipient of the NUS and Faculty Teaching Honour Rolls, she has lectured at the Bartlett, Delft, ETH Zurich, Melbourne and the Berlage Centre. Her work is situated at the intersections of architectural representation, gender and affect in a contemporary interdisciplinary context. Her research explores the emergence of architecture through, and from within, everyday encounter and its archives. Influenced by film, art and literature, she is engaged in how an affective construction of architectural discourse might change the writing of its histories and theories. She conceptualized, researched and collaborated on the award-winning architectural essay film about single women occupants in Singapore’s public housing 03-FLATS (2014). 03-FLATS won the best ASEAN documentary Salaya 2015; was shortlisted for the Busan Wide Angle Documentary Prize 2014; and was screened at the Singapore Pavilion at the Venice Biennale 2016. Her publications include the forthcoming monograph Architecture and Affect: Precarious Space (Routledge, 2019) and a co-edited volume Asian Cinema and the Use of Space (Routledge, 2015). She is working on a book about public art in the Singapore city core, and co-editing a volume on domesticity in architecture. Lilian is on the editorial boards of The Journal of Architecture and Architectural Theory Review. Daniel P.S. Goh is Associate Professor of Sociology at the National University of Singapore. He obtained his PhD in Sociology from the University of Michigan, Ann Arbor, USA, in 2005 and has been with NUS Department of Sociology since, where he serves as the Deputy Head. He specializes in comparative-historical sociology and studies state formation, race and multiculturalism, Asian urbanisms, and religion, and has published over 40 articles on these subjects in internationally refereed journals and edited books. He has edited and co-edited several books, including Race and Multiculturalism in Malaysia and Singapore (Routledge, 2009), Worlding Multiculturalisms: The Politics of Inter-Asian Dwelling (Routledge, 2015), Precarious Belongings: Affect and Nationalism in Asia (Rowman & Littlefield, 2017), and Urban Asias: Essays on Futurity: Past and Present (JOVIS Verlag, 2018). He has also co-edited special issues in Urban Studies, International Journal of Urban and Regional Research, Ethnography, and International Sociology. He was co-Principal Investigator of the Ministry of Education Academic Research Fund Tier 2 project, Aspirations, Urban Governance, and the Remaking of Asian Cities (2013-2016). He is currently co-Principal Investigator of the Ministry of Education Social Science Research thematic grant project, Christianity in Southeast Asia: Comparative Growth, Politics and Networks in Urban Centres (2017-2020). Toh Jia Han is a Year 4 Japanese Studies and English Linguistics double major at the National University of Singapore. He is currently working on a graduation thesis regarding the internationalisation of Japan through education, and he hopes to work in Japan after graduation. He is also an editor and producer on the NUS “Home on the Dot” podcast. Shriya Sharma is a Year 1 student at the National University of Singapore. She plans to double major in Communication and New Media, and Political Science. She hopes to pursue journalism in the future. She is also a producer on the NUS “Home on the Dot” podcast. ASIA TRENDS is an ARI flagship public outreach event. This annual series of public lectures showcase the work of ARI’s research clusters, highlights the relevance of ARI’s research to Singapore, and relates Singapore to the rest of Asia from the perspective of significant trends in the region. It is an opportunity for ARI to connect with the larger Singapore community through sharing and interacting with various public sectors (citizenry, government), civil society organizations, businesses, universities and colleges, by presenting cutting edge research on major trends in Asia. Some trends examined in the past include ” China’s Religious Renaissance,” “The Cost of Care,” “Perspectives on Marital Dissolution: Divorce Biographies in Singapore,” “Creating Centralities” and “What is Sinophone World Literature? : China, Southeast Asia, and the Global 60s”. Each ARI research cluster hosts an evening talk, during which usually an overseas speaker, who is a prominent researcher or scholar, is invited to examine an emergent trend in that research field; a Singapore-based researcher then provides comments on local development with regard to the trend in question. Past seminars have witnessed interesting interaction between speakers and commentators and lively audience participation in the discussions.